Tonight’s game is the fourth of six regular season meetings between the Saskatoon Blades (39-10-0-2) and the Regina Pats (18-25-6-1). Despite their wide gap in points and positioning in the Eastern Conference, the Pats have beaten the Blades in 2 of the 3 previous meetings this season, including a 4-3 Shoot-out win over Saskatoon in the last meeting back on Jan 13th in Regina. That night the Pats jumped out to a 2-0 first period lead and then relied on goaltender Matt Hewitt to secure them the win as he was forced to make 59 saves on 62 shots in order to pick up the “W”. The Blades are lead offensively against the Pats by Marek Viedensky who has collected five points (3G 2A) in the three games vs. Regina this year. After Viedensky; Stefan Elliott (1G 2A), Curtis Hamilton (1G 2A), and Josh Nicholls (3A) round out the top 4 scorers against the Rebels. For the Pats; Jordan Weal has 6 points (4G 2A) vs. the Blades this season. The Saskatoon Blades won a wild-scoring and wildly-entertaining contest Tuesday…out-scoring the Red Deer Rebels 7-5 in front of 5,184 fans at Credit Union Centre. The top two teams in the Eastern Conference squared off in a see-saw struggle that included a couple of first period fights while scoring goals from all lengths and angles off beleaguered netminders Steven Stanford of the Blades and Darcy Kuemper of Red Deer. Brayden Schenn scored twice, including a power play goal 58 seconds into the third period that broke a 3-3 tie. Josh Nicholls followed that up 16 seconds later and the Bridge City Bunch would not be caught the rest of the way in winning their sixth straight game and ending the Rebels’ 11-game winning streak. 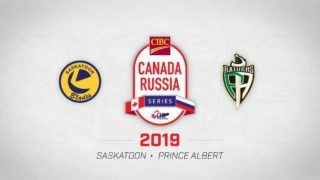 Darian Dziurzynski, Dalton Thrower, Chris Collins and Jake Trask also tallied for the 39-10-2 Blades who, with 80 points, now lead the Eastern Conference by five points over Red Deer. Saskatoon also holds two games in hand. – King Size Match-up – tonight’s game will be of interest to the LA Kings who will have 2009 first round pick Brayden Schenn and 2010 third round pick Jordan Weal facing off against each other for the first time this season. Weal and Schenn finished 3rd and 4th respectively in WHL scoring last season giving the Kings a tremendous pair of prospects for the future of their club. Weal is currently ranked 9th in the league in scoring this year with 63 points and Schenn is putting up an average of 1.875 points a game which is tops in the WHL this season. 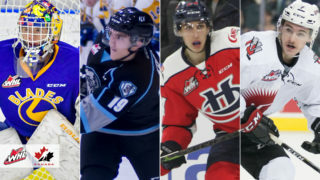 – Last Wednesday, the CHL announced their week 18 Top 10 rankings which are voted upon by a panel of NHL Scouts. 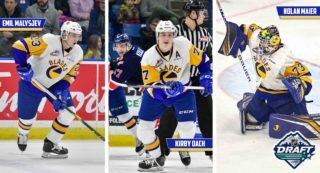 This week’s rankings have the Blades ranked 3rd in the CHL behind the Saint John Sea Dogs and the Mississauga St. Mike’s Majors. – Brayden Schenn’s 2nd goal last night was the 100th regular season goal of his WHL career. The 19 year old LA Kings prospect has 273 points in 203 career games. Since joining the Blades, Schenn has been held off the score sheet just once and has 11 points (5G 6A) in 6 games played. 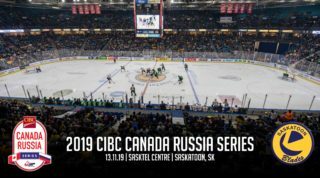 – The Saskatoon Blades enter tonight’s game on a season high six game winning streak. 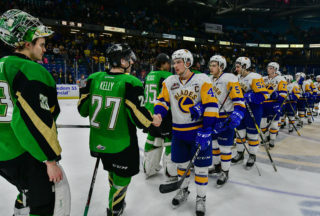 During that time, the Blades have outscored their opponents 33 to 17. The Blades PP has also seen a dramatic turnaround and has been clicking at a 31.0% success rate over the last 6 games (9 for 29). – With 63 points, Josh Nicholls has moved into a 10th place tie for scoring in the WHL. The 18 year old Toronto Maple Leaf prospect, who will be playing in his 185th career game tonight, also leads the Blades in goals scored (25) and power-play goals scored (7). – Stefan Elliott was a +2 in last night’s 7-5 win over Red Deer which raised his season total to an impressive +40 mark. Elliott is ranked 2nd in the league in +/- this season behind only Brendon Kichton of the Spokane Chiefs.